Explanation: How different does sunset appear from Mars than from Earth? For comparison, two images of our common star were taken at sunset, one from Earth and one from Mars. These images were scaled to have same angular width and featured here side-by-side. A quick inspection will reveal that the Sun appears slightly smaller from Mars than from Earth. This makes sense since Mars is 50% further from the Sun than Earth. More striking, perhaps, is that the Martian sunset is noticeably bluer near the Sun than the typically orange colours near the setting Sun from Earth. The reason for the blue hues from Mars is not fully understood, but thought to be related to forward scattering properties of Martian dust. 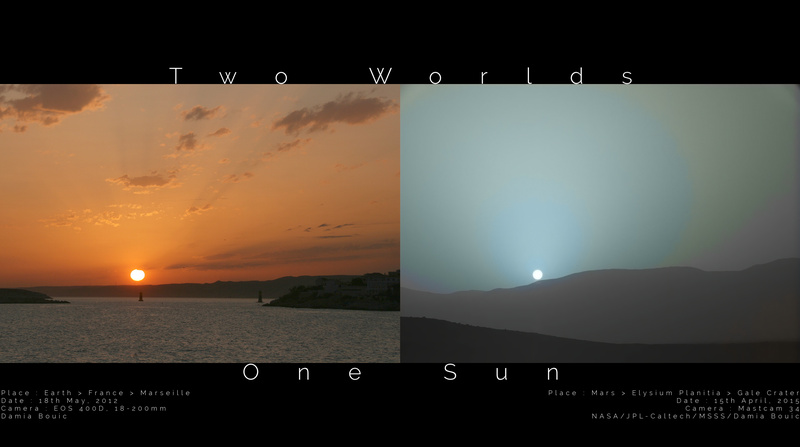 The terrestrial sunset was taken in 2012 March from Marseille, France, while the Martian sunset was captured last month by NASA's robotic Curiosity rover from Gale crater on Mars.